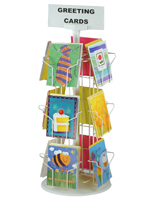 This Greeting Card Fixture Features 24 Pockets to Display Your Paper Merchandise. This Unit That Has Wire Shelves is Economical! 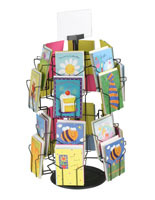 This Greeting Card Fixture has a Spinning Base to Make Browsing Easy! Sturdy rotating base enables easy browsing. Configured to hold 24 unique items. Customizabel sign clip at the top for messaging. 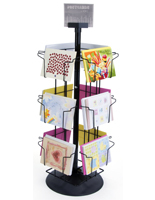 This greeting card fixture generates impulsive purchases at the register! 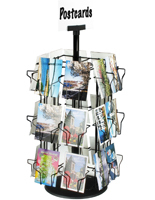 Small enough to fit on a countertop so people spot it on their way out, this item is a great little revenue generator. 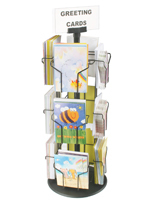 Place this greeting card fixture in a drug store or gift shop or any other retail-type venue. Smaller stores that have minimal space are a great location to display this storage rack that has a hexagonal shape and wire shelves. 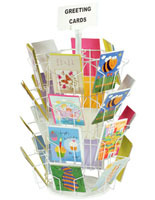 This display spins on its round base so customers have an easy time getting at the cards in this greeting card fixture. 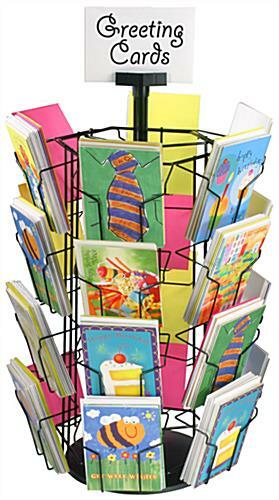 Each of the (6) sides of this wire shelves unit has (4) pockets that will accommodate 5"wide x 7"high greeting cards. That gives your 24 unique pockets to display your wares! 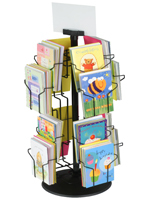 This greeting card fixture, also known as a storage rack has a glossy black finish, a solid plastic base, and a customizable sign clip atop for additional advertising. "Holiday Cards," "Valentine's Day," "For Children" are some of the messages that are typically used. But store owners can design their own message to put at the top. 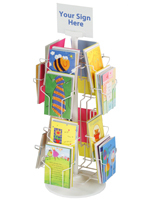 This greeting card fixture that is a paper goods display gets shipped unassembled but it only takes a minute to set up! Order this unit of wire shelves today!